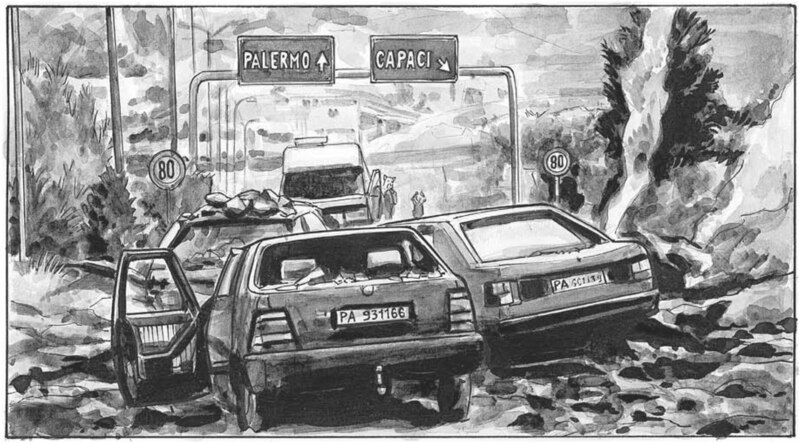 On May 23, 1992, a half-ton of explosives was detonated in a culvert running beneath the highway that connected the city of Palermo to the international airport at Punta Raisi, killing the prosecuting magistrate Giovanni Falcone, his wife Francesca Morvillo, and the police officers Rocco Dicillo, Antonio Montinaro, and Vito Schifani. Two months later, Paolo Borsellino, Falcone's childhood friend and unerring companion in the struggle against the Sicilian mafia, was killed by a car bomb in front of his mother's house. 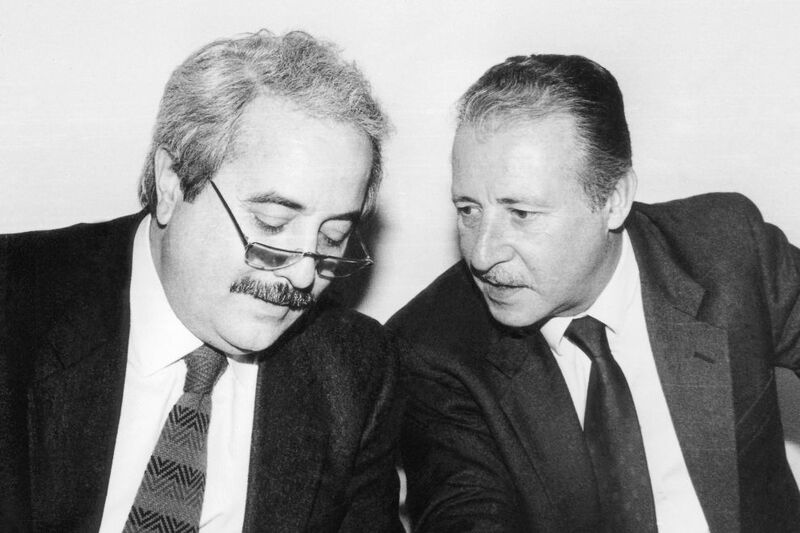 Together, Falcone and Borsellino had formed the nucleus of the Antimafia Pool, a group of judges inaugurated by Rocco Chinici, who was himself murdered in 1983. 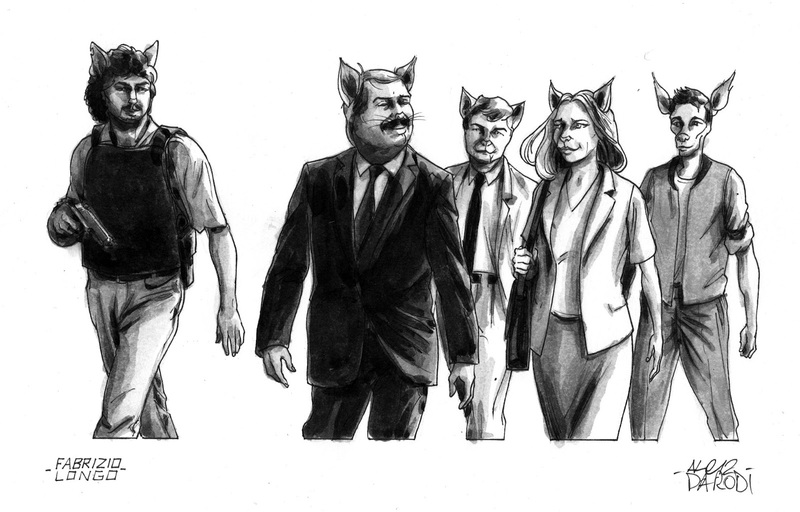 Modeled on judicial reforms adopted by the antiterrorism investigators in northern Italy during the anni di piombo (years of lead), the Antimafia Pool worked to centralize and streamline mafia investigations, animated by a series of legal measures passed in 1983 that for the first time defined mafia membership as a crime in its own right. The crowning achievement of the Antimafia Pool was the Maxi Trial, which began in February 1986 and extended to December 1987. Held in a specially constructed bunker of reinforced concrete, built to withstand missile attacks, and presided over by a group of judges who themselves lived in virtual imprisonment, the Maxi Trial served indictments to some 474 defendants. When the verdicts were handed down, 360 were convicted, among them the fugitive bosses of the Corleonese family, Totò Riina and Bernardo Provenzano, instigators of the Second Mafia War, which claimed over a thousand lives. In the ensuing years, the majority of the convicted would be exonerated on the thinnest of pretexts, thanks to a network of corrupt officials stretching all the way to Prime Minister Giulio Andreotti, leading many to conclude that the anti-mafia struggle had been a failure, until Falcone, depressed by the apathy of his new chiefs in Palermo, took a post in the Ministry of Justice in Rome. From there, he immediately took actions to re-arrest the freed mafiosi and established a central office for the investigation and prosecution of organized crime. When, as a result of his efforts, the Italian Supreme Court confirmed the original Maxi Trial convictions, Falcone's death warrant had been signed. Yet the wave of assassinations that followed upon the Maxi Trial convictions, far from cowing the populace of southern Italy, gave rise to a series of arrests that permanently weakened the power structure of Cosa Nostra. 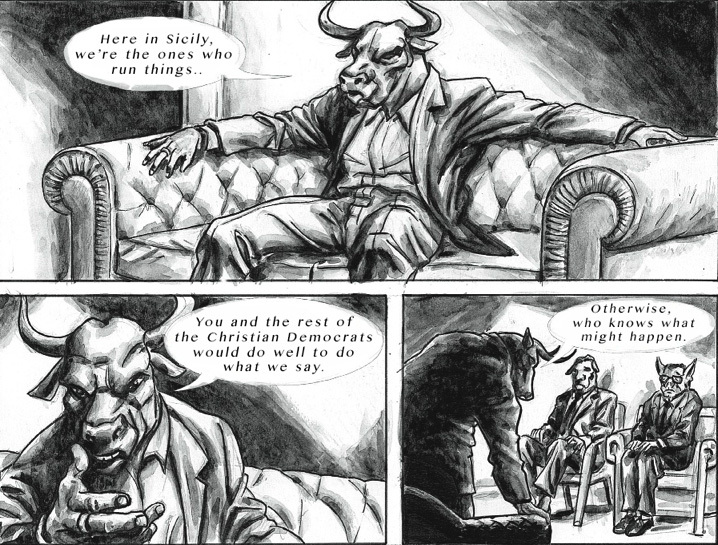 The story of the Antimafia Pool has been retold recently in the exhaustively researched and painstakingly illustrated Un fatto umano by Manfredi Giffone, Fabrizio Longo, and Alessandro Parodi. The product of seven years' labor, with a cast of over 200 characters, nearly 400 watercolor illustrations and a bibliography of 160 books, Un fatto umano is a work of unprecedented maturity and moral scope. Particularly today, when the menace of the mafia state looms darkly from the Balkans, Africa, and South America—a situation only worsened by the global economic crisis—Un fatto umano is both a warning and a thoughtful corrective to the romantic notions of mafia swagger that pervade popular culture. Few English-speaking readers are familiar with the Second Mafia War, the Maxi Trial, and the careers of Falcone and Borsellino. Can you say a bit about their significance, both historically and in relation to contemporary life in Italy? It is not easy to give a thorough account of the importance of Falcone and Borsellino, two judges from Sicily, both national heroes, let alone of the events that drenched Italy in blood between the late seventies and the early nineties. Suffice it to say that before the work of the Antimafia Pool, it was still possible to hear apparently reasonable people debate whether the mafia existed or whether it was merely an invention of literature or folklore. Only a small number of journalists and investigators had a vague notion of the structure of organized crime and its inner workings. This continued to be the case until the Maxi Trial, a judicial inquiry in which, thanks to years of intense work by Falcone, Borsellino, the Antimafia Pool and their allies, the mafia itself was put on trial: not a group of single defendants, but the criminal enterprise itself. The work of Falcone and Borsellino, therefore, not only demonstrated what the mafia was, in a juridical sense, but has also made possible the disclosure of its internal mechanisms. The Sicilian mafia has existed without interruption for nearly a century and a half. Traditionally it has disposed of numerous allies in Italian politics as well as strong criminal networks overseas. Giovanni Falcone was the first Italian magistrate to establish working collaborations with his foreign counterparts; for example, he worked closely with Rudolph Giuliani on many cases, including the Iron Tower, which is dealt with in our book. The history of the mafia, especially in its most recent permutation, cannot be separated from the history of Italy over the past thirty years. Italy was a country of great importance for establishing geopolitical equilibrium in the Cold War days, and it frequently became a theater for conflicts arising from the power struggle between the West and the Soviet bloc. It is now clear that in this clandestine duel for Italian territory, the Sicilian mafia, given its military strength and its longstanding judicial impunity, was a useful armed proxy of these two groups wrestling for control over this particular square of the chessboard. Italy is, in addition, a country with special political characteristics which may seem odd or even perverse from an outsider's perspective. To take one of the most prominent examples: Giulio Andreotti, a highly influential politician of the so-called First Republic, served seven terms as President of Council as well as holding the office of Prime Minister; and yet despite, or rather because of, his enormous political clout, he spent years in intimate contact with the mafia and was at the center of virtually every one of the scandals that plagued Italian politics until the end of the nineties. After an exhaustive trial initiated by the Prosecutor's Office of Palermo, it was established that Andreotti was guilty in the matter of external collusion with mafia associations, but by the time he was convicted, the statute of limitations on this particular offense had expired. After the deaths of Falcone and Borsellino, the Italian political world was plunged into chaos and the system that emerged afterward is almost certainly the fruit of direct negotiations between the Italian state and the Sicilian mafia. Silvio Berlusconi, the person who has left the deepest mark on Italian politics over the last twenty years, is an entrepreneur and politician whose links to the mafia have always been evident and have even recently been confirmed in a courtroom setting, albeit indirectly. One of his right-hand men is the Palermitan Marcello Dell'Utri, who provided the intellectual and material basis for Forza Italia, the party under whose banner Berlusconi was elected Prime Minister in 1994, thus beginning his political career. Throughout the two decades preceding Berlusconi's rise to power, Dell'Utri had been steeped in mafia business. The frequency with which his name appears alongside those of other "men of honor" shows him to be a person who, far from pristine, is in fact a kind of white-collar Mafia associate exercising immense influence over Italian politics. Given the nature of his alliances, he has been brought before the court and even sentenced for external collusion with mafia groups. The Supreme Court of Cassation on April 24, 2012—the occasion of the annulment of Dell'Utri's initial appeal and of his trial's deferment—went so far as to state that Marcello Dell'Utri "has engaged in behaviors advantageous to mafia interests during the period in question, facilitating the payment of illicit moneys to Cosa Nostra on Fininvest's behalf." In the best of cases, in other words, Dell'Utri has blackmailed Berlusconi at the behest of the Sicilian Mafia. Regardless, Berlusconi would go on to become the head of the political party founded by his "friend" Dell'Utri. How did the writing of Un fatto umano come about? The idea was to tell a story every Italian would know, but in a different medium and from a different angle. The bibliography concerning these events is boundless and there are even movies and television shows, but when we first began working on the project, there were no comics. We knew we wanted to do something large-scale, set in Italy and looking at issues that Italian comics, particularly the kind sold in kiosks, had failed to take into consideration. The story of the Antimafia Pool was the only one that seemed suitable in scope. For a few years we threw out other ideas, but with this theme, we found an ideal balance between the content and form we wanted, and at that point, the wheels were set in motion. When we first began work on Un fatto umano, the idea had been to focus on the work of the judiciary, because I wanted to make known what Falcone and Borsellino had done, and even today, that remains the kernel of the story. But after setting to work, the research got away from me, expanding into a seven-year commitment consulting hundreds of books, whole years' worth of newspaper articles, thousands of pages of trial documents, and articles on the web, not to mention documentaries, films, and interviews. It was an exhausting and inspiring effort documented in the nearly eighty-page bibliography on the book's Italian website, which lists, page by page, panel by panel, all the sources employed in the reconstruction of an individual scene. Your book is roughly contemporary with Roberto Saviano's Gomorrah and Matteo Garrone's film of the same name. Do you see any similarities between your work and theirs? Do you feel that their appearance says something about the tenor of the times? 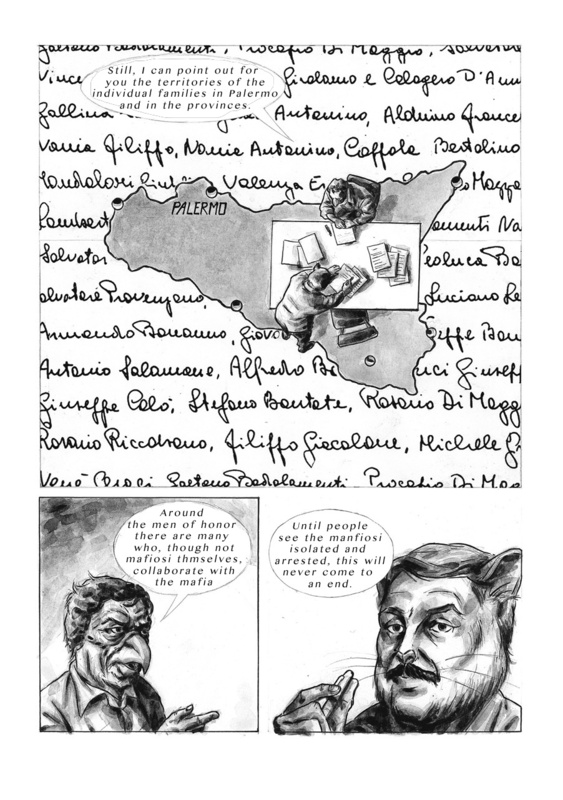 I began working on Un fatto umano in 2005, the year before the publication of Roberto Saviano's Gomorrah. A friend of mine who works in publishing was one of the first to take note of Saviano, in the days when no one had a clue who he was and he was still writing on his website Nazione Indiana. He presented Saviano to the publisher he works for, Fandango. This friend knew of my project and thanks to him I found out about Saviano's book long before its massive success, and I was able to follow its evolution. I also came to know Matteo Garrone just before he began work on the screenplay of the film. In this sense, Gomorrah has been a constant presence during my work on Un fatto umano. Both the book and then the film have had enormous resonance, shedding light on the mafia in a way that would previously have been inconceivable. Nonetheless, Un fatto umano and Gomorrah are two very different works. I would therefore limit myself to saying that during a given period of time, particular attention was paid to the mafia theme and that in some surreptitious, subconscious way, the issue had gotten under our skin so that we all felt the need to tell these stories, to engage in projects that have required long years of gestation, and, in Saviano's case, that have completely altered his personal life. With the exception of the puppeteer Mimmo Cuticchio, who narrates the action of the book, all the other characters are portrayed as animals. What reasons lie behind that choice? A book of mafia history implies a quantity of names and relationships that can make even an expert reader swoon. And even if seeing the characters on the page helps you to orient yourself, something more seemed necessary. In the end, the choice of comics as a means of expression already suggested the use of animal features. From comics' earliest days, animals have been employed so broadly and so often that they have come to comprise a genre of their own: "funny animals," in the argot of cartoonists. Examples would include George Herriman's Krazy Kat, Pat Sullivan and Otto Mesner's Felix, Walt Kelly's Pogo and, naturally, Charles M. Schulz's Snoopy and the entire range of Disney creatures. But with time, certain authors began to wonder whether it was possible to use funny animals to tell stories that went beyond mere amusement: Art Spiegelman's Maus is the most renowned example, but even before Spiegelman, in 1944, the Frenchmen Edmond-François Calvo, Victor Dancette, and Jacques Zimmerman used the same technique in La bête est morte, telling of the advent of Nazism first-hand. In fact this type of anthropomorphism is not limited to comics or cartoons; even without mentioning La Fontaine, or Phaedrus, or Aesop, let alone the numerous religions that depict animals as deities, it is enough to remember writers like Carroll, Collodi, C.S. Lewis, Kipling, even Kafka and Orwell, who have used animals as characters in their masterpieces. This approach very quickly yielded advantages. Above all it allowed me to present a complex story in an apparently simple manner, given the universal predisposition to associate the personification of animals with children's literature. From the visual point of view, a character with animal features is more easily recognizable, and moreover, as we as animals are frequently identified with human qualities, we could tell the reader something about the character of the heroes and antiheroes as soon as they appeared on stage. Eventually this would also serve as the perfect pretext to rope in Mimmi Cuticchio, an exceptional oprante and cuntista, who narrates Un fatto umano between acts, just as, in real life, he narrates stories of paladins and Saracens. Given the story's enormous complexity, a narrator who stood outside the events recounted proved indispensable. Because it is set mainly in Sicily, the idea of using a puppeteer was the first one that came to mind, but I rejected it at first because it seemed overdone. But then, I was lucky enough to meet Mimmo Cuticchio and I fell immediately in love with his work. Mimmo Cuticchio is the most famous and probably the most talented oprante still alive and carrying forward the ancient Sicilian tradition of puppet operas. You could easily mistake what he does as entertainment for children, just as we often imagine comics to be; but the puppet operas are a deeply refined art form of astonishing range, requiring extraordinary skill to be set in play. It is also deeply rooted in the native culture of Sicily. Cuticchio is a master of the ancient art of the cunto as well. This is a kind of oral narration in dialect, typical of western Sicily, with essentially the same repertoire as the puppet operas but without any scenic auxiliaries. The cuntista stands alone before his public and enraptures them by means of his inventiveness and his voice's rhythmic force. Once I went to one of Cuticchio's performances and he recited the entire action of the Iliad in little more than an hour; it was something absolutely breathtaking. The cunto will succeed in capturing the attention of anyone possessed of a musical sensibility irrespective of whether he understands Italian, let alone Sicilian dialect; for example, at one show, I saw Brian Eno seated next to me! When I proposed the project to Mimmo he was kind enough to accept after only seeing the sketches of the characters and a draft synopsis. And since I was availing myself of a real person and not an imaginary puppeteer, I studied Cuticchio's work, attended as many of his shows as possible, and invented a mise-en-scène inspired by some of his works, so that we would distort Cuticchio's art as little as possible. The scandals your book brings to light—the collaboration between Licio Gelli's P2 Masonic Lodge and the Vatican bank, and the ties between Andreotti's and Berlusconi's governments and mafioisi—give the impression of a parasitically unredeemable state. Now, when Berlusconi and his mafia dealmaker Dell'Utri have both been convicted of serious crimes for which they have thus far avoided imprisonment, is it possible to say that progress has been made in the war on corruption? I would have to say no. The list of Berlusconi's indictments is vertiginous, there is an entire Wikipedia page devoted to the subject. In Italy, for twenty years, there's been talk of nothing else: Silvio Berlusconi and his run-ins with the law are the principal topics on the talk shows as well as at the bar, and they divide public opinion down the middle. Yet his convictions are relatively few: most of the indictments against him have been shelved, or the offenses pass their statute of limitations or are amnestied, and as a result, in many cases they opt for a nonsuit; and then there are verdicts of acquittal for insufficient evidence or because the act under consideration no longer constitutes a criminal act. Numerous times, Berlusconi, in his role as head of state, has enacted laws decriminalizing an offense for which he himself was facing prosecution. The judicial status of Marcello Dell'Utri is another matter, as we are dealing here with a proven record of continuous and persistent mafia or para-mafia activities. Of course it should be noted that the criminal activities of Marcello Dell'Utri implicate, at least logically, Silvio Berlusconi, with whom he has collaborated closely for decades. In a very famous wiretap from 1980 between Vittorio Mangano, a mafia boss and international drug trafficker, and Marcello Dell'Utri, the two discuss the terms of sale of a horse. Mangano even counsels Dell'Utri, rather brusquely, to appeal directly to Berlusconi for money for the purchase of this particular "horse." Mangano was condemned to ten years in prison for similar conversations with other mafiosi concerning such horses, because it was clear, beyond any reasonable doubt, that "horse" was a banal codeword for drugs. The same Marcello Dell'Utri introduced Vittorio Mangano—I repeat, a noted mafia boss—into the house of Berlusconi, where he lived for years, officially exercising the profession of stable-keeper. This version of the facts has never been disputed at the judicial level even if it must seem like the stuff of fairy tales to an outsider. But Berlusconi is only the tip of the iceberg. The situation of corruption in Italy has worsened so severely over the past twenty years that the President of the Court of Auditors, during the opening ceremonies of the judiciary session at the beginning of this year, felt it necessary to raise the alarm concerning the threat posed to the nation's economy by systematic corruption. Berlusconi is a symptom of a feeling, very widespread among the Italian political class, where corruption, blackmail, and embezzlement are the order of the day; but he is not necessarily the cause. Tommaso Buscetta, the mafioso-turned-pentito, provided the evidence necessary to confirm that Cosa Nostra was a unified body with centralized decision-making; his revelations formed the backbone of the Maxi Trial. Buscetta was intelligent and articulate, and it is difficult not to see him as something of a hero; nonetheless, he was a large-scale drug trafficker and murderer. How are we to judge Buscetta? Were his confessions an act of conscience or merely a gesture to save his skin? Buscetta is such a fascinating character that in the first draft of Un fatto umano I had chosen him to be the narrator. Fortunately I came to recognize my error in doing so. Buscetta wouldn't have functioned as an omniscient narrator and would have had no means of knowing many of the events I wanted to recount: the workings of the antimafia forces, for example. Studying Buscetta's declarations carefully, especially his stream of confessions to Falcone, you come to appreciate the fundamental strategy of this person who was the first collaborator with justice to play a key role in the war against the mafia in Italy and the USA. Due to Falcone's perspicacity, his intelligent questions, Buscetta let loose an enormous number of facts, almost all of which could be demonstrated in a court of law. Not only did he explain the organization of Cosa Nostra in minute detail; he also clarified the nature of the extermination campaign waged by the Corleonesi at the expense of the other mafia cosche, including Buscetta's own, in the so-called Second Mafia War. However, as much as Falcone might have insisted, Buscetta refused to talk about the ties between the mafia and politics, and this was one of the reasons it was possible to bring the Maxi Trial to an end, as would become clear over the next thirty years. Buscetta released his declarations deliberately, and found in Giovanni Falcone the perfect interlocutor, someone who could understand the gravity of what he was saying and also weigh it from the judicial point of view. Falcone and Buscetta were both from Palermo, both grew up in humble neighborhoods, they were two very intelligent people on two opposite sides of the fence. Their common origins allowed them to understand each other in a way that would have been difficult for an outsider to penetrate. The Sicilians have a language of their own, made up of gazes, silences, phrases that go unsaid, of insinuations and allusions, and I doubt Buscetta would have placed his trust in someone who did not have a grasp of this code. At bottom, I feel Buscetta's decision to collaborate with justice was as calculated as it was desperate: he wanted to save his own skin and that of his family, and to avenge himself against his rivals, the Corelonesi. He was one of the most important figures on the losing side and could only address himself to the law. Falcone and Borsellino displayed none of the overzealousness or vigilantism that are the staple of police dramas—they worked patiently and deliberately, with scrupulous respect for the law; and yet, in Palermo in the 1980s, this kind of integrity was revolutionary. Was it difficult to break with the cliché of the cop who has to get his hands dirty—to portray an environment in which the difference between right and wrong was unequivocal? Throughout Italy we are aware of being known overseas for pasta, espresso, and soccer, naturally for our artistic treasures as well, but also for the mafia. And beyond the stereotype, there naturally lies some truth. Yet whereas any Italian can make a plate of pasta or a decent espresso, there are still relatively few people who are informed as to the nature of the mafia; far fewer than there should be in a country where three criminal organizations have vast control over the territory as well as international contacts and move hundreds of millions of euros. It may seem strange, at least to me it does, but the pages that cover the mafia and related themes in Wikipedia in English are on average twice as long as the entries in Italian and are often far more accurate. Likewise, one of the best books on the history of the Antimafia Pool in Palermo was written by Alexander Stille, an American journalist. For this reason, every time I came to understand the significance of a passage of the story I was writing, I tried to synthesize it for readers whose level of awareness was as lacking as my own. I also wanted to address myself to people from other countries who were in all likelihood ignorant of Falcone and Borsellino's existence and whose idea of the mafia was based in cinematic clichés. From today's perspective, it is possible to have the impression that Falcone and Borsellino and all the magistrates who contributed to the fight against the mafia from the seventies to the nineties, frequently at the cost of their lives, did not dirty their hands. This is true in the sense that they did not compromise themselves by criminal actions. But there is no doubt that the war they decided to fight was an extremely dirty one in which, in far too many cases, one had to be on guard against one's friends as well as one's enemies. And in spite of this, they remained normal people; this is what should make them heroes in our eyes. Manfredi Giffone (Turin, 1977) is an author and translator. After studying Communications Sciences, with a thesis on the works of Alan Moore, he completed a special course in storytelling with Paul Karasik and a Master's in Publishing at the Scuola Superiore di Studi Umanistici under the direction of Umberto Eco. In addition to Un fatto umano, he has written a number of short fiction works and comics for various independent publishers. His most recent translations into Italian include The Signal and the Noise, the best-selling work on statistical prediction by Nate Silver, and The Three Christs of Ypsilanti by Milton Rokeach, both for Fandango Libri. He has also co-translated two novels by Clara Sánchez and is currently working on an adaptation of Lidia Ravera's Porci con le ali. Adrian West is a contributing editor at Asymptote. He has translated from German, Spanish, and Catalan for such publications as The Brooklyn Rail, Words without Borders, Fwriction, and Aldus, and his fiction has appeared in McSweeney's and 3:AM. He lives in Philadelphia with the cinema critic Beatriz Leal Riesco.